On a rainy but warm September day my husband, niece and I ventured into the heart of Naperville to attend my niece’s first Pow-Wow hosted by the Midwest SOARRING Foundation. We saw many things that afternoon from beautiful dancing, drumming, art, story telling, and songs to hand-carved flutes., other Native American crafts and more. 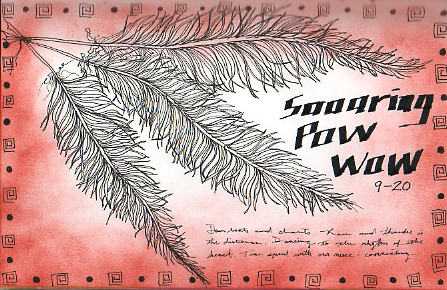 According to the SOARRING Foundation website, pow wows are a time to celebrate life, renew friendships, and share our Native American culture. Both my niece and I have a shared Native American heritage that I wanted to help her celebrate and explore. This event was both fun and uplifting. We also enjoyed the plentiful food and awesome sarsaparilla sodas. It was an eventful day that I will never forget. Here my artistic remembrance of that day.